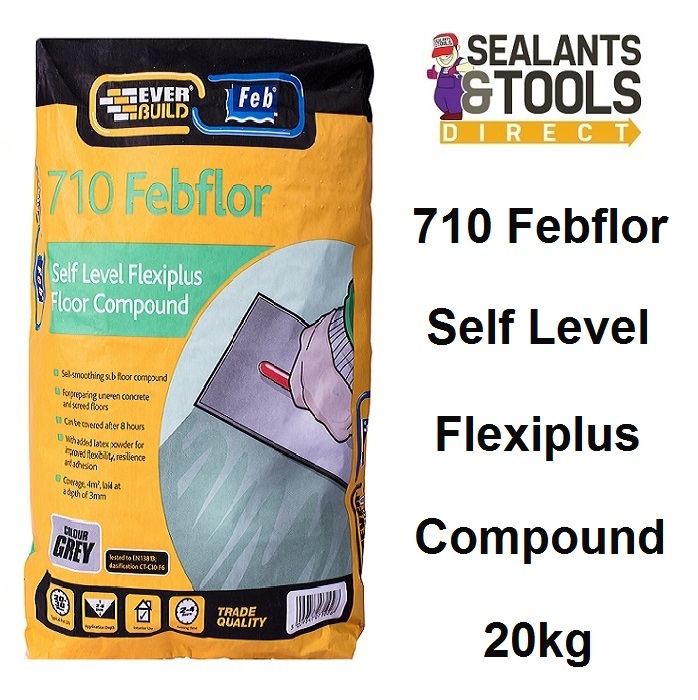 Everbuild 710 Flexiplus already contains powdered latex, eliminating the need for separate expensive latex liquids. When mixed with water, can be used to level out uneven floors and screeds. Typical surfaces include concrete and screeding, existing ceramic tiles, asphalt, wood, brick, stone etc. Intended for use prior to laying ceramic tiles, thermoplastic tiles, lino, wood block flooring or carpet. Enhanced flow properties coupled with long open time giving easy trowelling. Fast setting - sets in 8 hours. NOTE: This product is not suitable for use as a final wearing surface. Always mix with clean fresh water and always prime floors as directed. Surfaces can be primed using Everbuild PVA Bond diluted 1:3 with water. The product will not resist rising damp. In these conditions, use in conjunction with BLACKJACK D.P.M liquid dampproof membrane as directed. Never exceed the quantity of water stated this will dramatically reduce strength and cause cracking. Do not mix more compound than can be laid in 20 minutes and never try to reconstitute once the product has set. On substrates where underfloor heating is in place, switch of the heating for 24 hours before and after application. Do not use this product below 4oC. "Important Note this is a non returnable product "
while in our care all products are kept in a climate controlled store room. because this is a reactive product we could not resell the product. The Product should be stored out of direct sunlight until used.